There are SHIELD agents guarding Stark's hospital room, because Stark is a major benefactor to them. Of course the fact that Stark also finances the Avengers isn't why they themselves turn up. Continuing my obsession with Wasp's costumes, in this 3-issue story she doesn't see any action, and may in fact be wearing civilian clothes. Dr Santini was previously seen in Fantastic Four #68-70 where he was trying to reverse the cosmic radiation that turned Ben Grimm into Thing. This specialist seems to specialise in several different branches of medicine. A Growing Man will reappear in several future stories. Of course they're not all necessarily the same one. The next occurrence will be Iron Man #108 in a tale called 'Growing pains'. (This title is something of a Marvel favourite, being reused for Growing Man appearances in Thunderbolts #5 and Sentinel Squad O*N*E #2.) In #23-24 Kang wanted Ravonna but she spurned the tyrant, until at the end she realised she did love him and sacrificed herself to save his life. Their love/hate relationship will continue down the years, including alternate versions and many twists and turns. The Grand-Master will later be revealed to be an Elder of the Universe, like the Collector from #28 and #51. These effectively-immortal Elders have each specialised in becoming the best at something, to stave off boredom. Collector is building the best collection, and Grand-Master excels at games. I give this issue a 5 for introducing the Squadron Sinister (and indirectly the Squadron Supreme), for turning Ravonna into an important ongoing plot-point, and for the Grand-Master who I always liked. 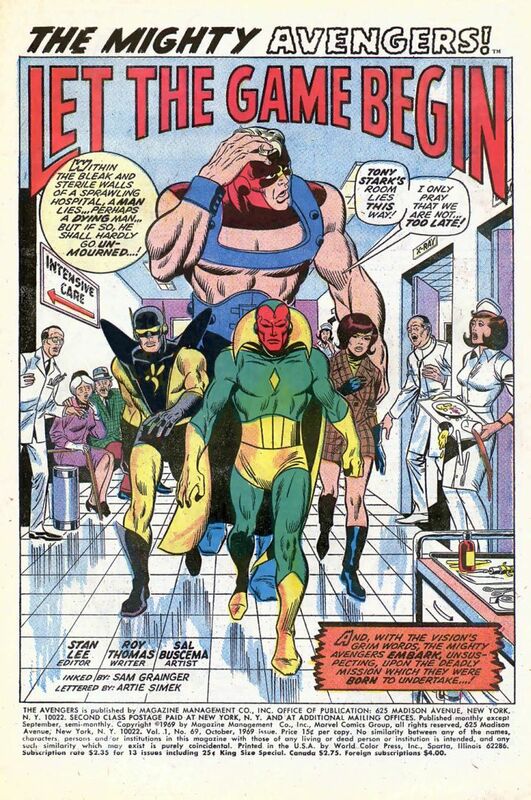 Goliath, Vision, Wasp, and Yellowjacket rush to hospital where Tony Stark is dying of a heart attack (in Iron Man #18). Captain America and Thor join them. Thor brings renowned heart specialist Dr Santini to save him. They are attacked by a giant android that grows from a small doll, and it grabs Stark's body. Thor recognises it (from Thor #140) as a Growing Man or Stimuloid (so-called because attacking it makes it grow bigger) that was used by Kang. The Stimuloid is beamed up with Stark, but the Avengers leap into the beam and find themselves in Kang's throne room in 4000 A.D. Beside him, held in stasis, is the body of his beloved Ravonna, killed at the end of #24. 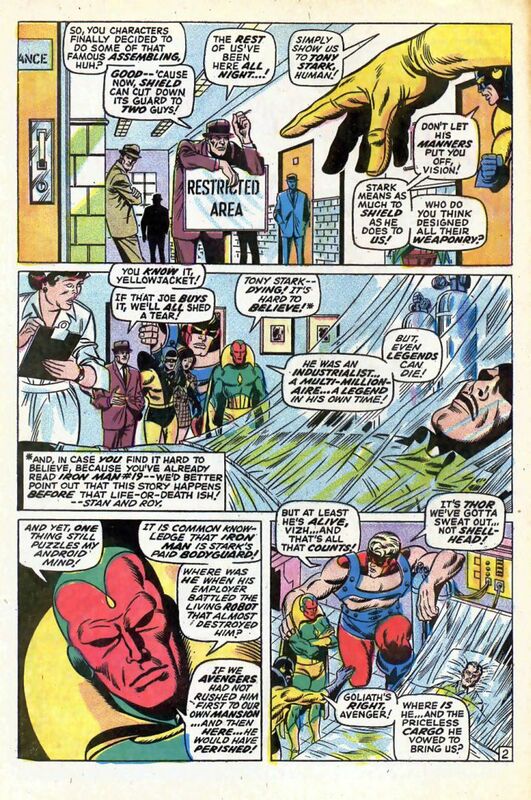 Kang indicates that the Growing Man had actually been sent to lure the Avengers here to serve him. The Avengers battle kang's guards until they are interrupted by Black Panther. T'Challa explains that Kang whisked him here from Wakanda, and that they should listen to what Kang has to say. The fate of the Earth depends on it. Kang relates how a being called the Grand-Master has challenged him to a duel employing champions. If Kang wins he gets the power of life and death with which to revive Ravonna. If he loses, or declines to play, then Grand-Master will oblterate the Earth. Kang has chosen the Avengers to represent him. They agree to fight, but only if Kang sends Stark home to be operated on. Kang complies, and Stark's life is saved in IM#19. 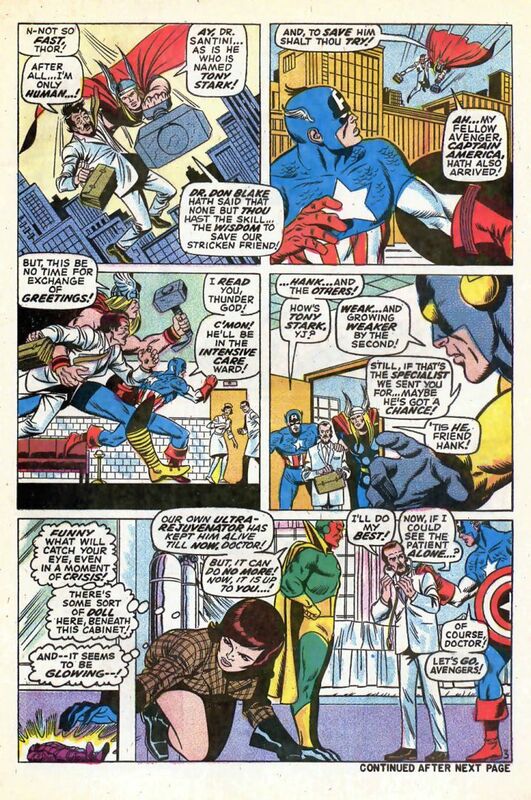 Grand-Master materialises, and sends Captain America, Goliath, and Thor to play the first round in the game. Their opponents are a group calling themselves the Squadron Sinister:- Dr Spectrum, Hyperion, Nighthawk, and Whizzer. Plus: Doctor Spectrum, Dr Jose Santini, Goliath (Clint Barton), Growing Man, Hyperion, Nighthawk, Squadron Sinister.